Every time I visit certain ubiquitous High Street bicycle shops, my heart sinks at the range of unsuitable bikes on offer. Either poorly made, or poorly designed, I am convinced a whole host of potential urban cyclists have been put off by the misery of discovering the bike they have brought is completely unsuitable for the job in hand. It is with great pleasure, then, that I introduce the first in a series of occasional blog posts reviewing what I believe to be the best bikes on the market suitable for getting about town. And the first bike to be tested and reviewed is a new product from a British bike design legend; Moulton. The Moulton TSR2 has been specifically designed to appeal to the urban and commuter market and is set up with lots of nifty new ideas to make your ride around town all that more appealing. At first glance this is just a cool looking bike, but a closer inspection reveals all manner of unusual and exciting features. Most obvious of all is the absence of a chain. You’ll never have to clean and oil a chain again with the TSR2 as it’s propelled by an 11mm 3/32 rubber belt drive. This makes for really smooth and super quiet running. Having never ridden a belt driven bike before I was worried that the rubber would be flimsy and susceptible to perish but my friendly Moulton expert who joined me for the test ride assured me it would out-last your average bicycle chain, and perform better too, by an order of 10 and without any of the maintenance associated with a traditional bicycle chain. This bike is a real fixie-killer, too. It’s got all the uncluttered elegance of a fixed wheel bike, and handles superbly due to its tiny 20” high-pressure wheels and rigid frame – you could fling this bike around any urban obstacle course and it would perform outstandingly for you. But this is no single speed hipster fad bike; concealed inside the rear wheel is a Sturmey-Archer S2C 2-speed kick-shift hub. Kick back one click to change up or down a gear, kick back again for a very effective back-pedal brake. The gears are suitably far apart to actually make a difference to your riding speed and comfort, and whilst the two-click back-kick system takes a little bit of practice and getting used to it makes for a very easy to use bike, with elegant uncluttered handlebars with no rear brake lever or gear shifter and cable. On my test ride I was first off at the traffic lights and soon cruising along at a rate of knots, despite feeling like I was putting in hardly any effort. When I did push the pedals the TSR2 fairly flew, but there was none of that shaky vibrating ‘about to disintegrate’ feeling I’ve had when riding other small wheeled folders at speed. Moulton have been the pioneers of bike suspension for nearly 50 years now, so have had plenty of time to perfect their technique. Despite the TSR2 being an entry-level model in the Moulton stable, it doesn’t disappoint; the attention to detail, knowledge of design and engineering, and skilled craftsmanship is as much in evidence here as it is in their high end bikes. With high pressure tyres you’d expect the ride to be a real bone shaker, but the unique frame ball and front suspension make for a super smooth ride. When riding along at cruising speed I felt like I was gliding along on a tiny-wheeled cushion of comfort; when I put the bike through its paces and stepped up the rating the feeling changed; gone was the soft cushiony feeling, replaced with a firm, fast and responsive ride, but one which absorbed every bump and hole in the road. There aren’t many rides on the market which could give you that kind of diversity. So many bikes are designed for one purpose, and one purpose only, but here’s a bike which could get a lady to work in high heels in high comfort and which you could win races on at the weekend. The frame is available in a gorgeous electric orange or more conservative black, and black mud guards are an optional upgrade. A series of luggage options are also available, though it’s a shame the beautiful frame doesn’t have braze-ons for more heavy duty bags and panniers suitable for touring. It’s a shame, too, that Moulton didn’t choose a harder working hub to support lights. I think integrated lights using a front and rear hub, whilst adding to the weight of the bike, would have truly set this bike aside as a serious contender on the commuter market. Indeed, the lack of lights and luggage options, and the fact that this bike separates, rather than folds, makes it unlikely that the TSR2 will be a challenge to that other British bike designer Brompton, who currently dominate the small-wheel market. The ability to fold a Brompton in seconds and jump on a bus or tube just gives them the edge. But if you are bored of middle of the road bog-standard commuter hybrids and are looking for a new bike with a bit of class, a shock of colour, and a little patriotic zeal, you’d struggle to do better than the TSR2. If you like to be able to arrive in style having barely worked up a sweat, but also want a bike which responds when you put some effort in (Dutch town bike riders, you know what I’m talking about!) then this could be the new ride for you. Priced at around £950 it qualifies for the Government ride-to-work scheme, and for that price is guaranteed to put a smile on your face each and every ride. When I took the TSR2 for a test ride around Hammersmith I was wary of just what all the fuss was about. My friendly Moulton enthusiast who I rode with is so passionate about the bikes that I was instantly sceptical (I’m always sceptical of enthusiasts!) By the end of the ride however all feelings of scepticism had evaporated; this is a beautifully built, wonderfully designed, great fun bike – and I want one! The Moulton TSR2 is available to order direct from the Moulton factory, or via Evans Cycles and other selected London bike shops. This review is formed of my own feelings and opinions; I have not received cash or favours from the bike designer or their associates in return for this review. Are you a practical town bike designer? Get in touch via the ‘About Me’ section if you’d like me to test your ride! Belt drive seems like a good idea, but I know that a lot of cyclists are sceptical about them. However, when you think that car engines use belt drives that can last 60,000 miles under much more load than a cyclist can produce then that's not an issue. However, of more concern for me are the wheels. 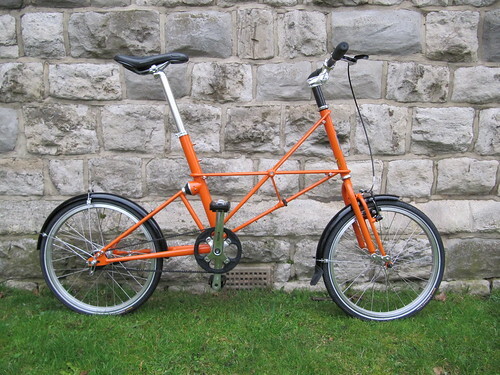 A work colleague had a Moulton, and the rear wheel spokes snapped with alarming regularity. I hope they've sorted that out on this version. It was a combination of the large geared hub and small wheel size that caused the problems. Quite unusual designs, but I had one of their Joey models for a couple of years, and it was a brilliant commuter bike. Hi Mike, thanks for stopping by and sharing your ideas. I too was sceptical about belt drives, but this one seemed to run like a dream and as you say they're used in much tougher industrial applications and last for ever. Nice to know you don't have to oil your chain anymore...! Regarding the wheels I hadn't heard about this, though I can understand the high pressure tyres might put more force on the spokes. 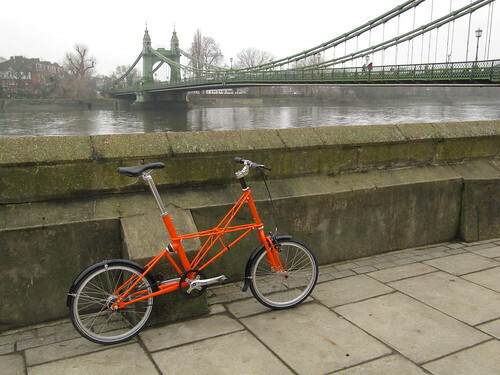 I had no problems during my (albeit limited) test ride around the potholes and canyons and Hammersmith, and I understand that if you are thinking about doing some seriously heavy duty mileage that the Moulton website does offer a double built wheel at extra cost. Thanks for the tip about Airnimal, I've seen a few of them around London, I'll be sure to get in touch and check them out! You have to be old enough to remember the '60s (what's that I hear you say? "if you remember the 60s, you weren't actually there"?) but the TSR2 has unfortunate echoes - it was the first ever swing-wing jet bomber, a huge technical advance but the budget got completely out of control and one of Harold Wilson's first acts on becoming prime minister was to cancel the program, thereby giving away our world technical leadership in aviation manufacturing. If you consider world leadership in aviation to be worth a bucket of warm spit, that is. Thanks for the history lesson Paul! I wasn't aware of the link with the name TSR2, but it could have been worse.. they could have called it 'new aircraft carrier' or 'Millennium Dome'(!) Who says history doesn't repeat itself...? I SO wish I could justify buying one of these, definitely in orange! 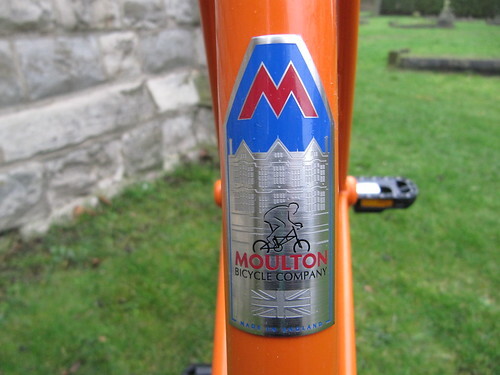 All the Moulton's I've tried have been rather nice to ride, so I'm sure this one is too. I found the suspension on one I used to own worked incredibly well on cobbled streets. As for practicality and reliability, it's not a bad attempt. The V-brake will let it down a little so far as reliability is concerned, but that's only thing, and there is another brake. Personally, I'd have preferred not to have straight handlebars, and maybe not so low either for a bike to ride around town. Not having a rack or lights is a real shame. It may make it lighter, but what use is a "sensible" bike without them ? Moulton racks generally work well. I don't understand your odd comparison with "Dutch town bikes". While the Moulton is lighter, so will initially accelerate quicker, the average Dutch bike will be somewhat more efficient over a distance. It comes down simply to physics. Larger wheels not only go over rough surfaces better but always offer lower rolling resistance than smaller wheels. Diameter is a part of the basic formula for rolling resistance. Your legs have to put in 50% more effort to overcome rolling resistance of ETRTO 406 wheels vs. 622 wheels, if both are fitted with similar tyres. What's more, this bike looks rather under-geared. This is often a problem with 20" wheels as it's difficult to buy large enough chainwheels to get a big enough ratio between front and back. In this case, with the belt drive option, the bottom gear is 53" and the top just 73". It's a little lower again with the chain. This is only going to work for quite slow riders. A cadence of 90 will achieve a speed of only 18 mph. Making any rapid progress requires spinning like crazy, which might be OK for a short sprint, but not over any distance. Unfortunately, one of the problems with belt drive is that it makes changing things like this rather difficult. With the chain drive option you can put on a bigger chainring, but then you've a dirty chain to deal with. Dutch town bikes, and also old English roadsters, are usually geared to enable continuous riding at higher speeds than this. And indeed, I ride mine at continuous speeds higher than this. I'm not saying that small wheels don't also have advantages. They make a more compact bike possible, they weigh less, and are often used on recumbents because the seat can be lower. This way, more can be gained by aerodynamic improvements than is lost due to rolling resistance. A smaller wheel should also be stronger than a larger wheel with the same number of spokes. Breakages of spokes in well made 36 spoke 20" wheels even of quite basic components should be incredibly rare - and indeed, that's been my experience in many years of riding small wheel bikes - no spoke breakages at all. Given the price of the Moulton, it ought to come with well built wheels, so any experience of someone breaking spokes regularly would be rather disappointing, and I would hope quite exceptional. Paul: Much advanced (for the time) technology, but no swing-wing on the TSR2. When I lived in Cambridge I rode my bike down to Duxford to take a look at it in the museum. How do you change the belt? At a glance it looks like you have to undo those two bolts on the seat stays and drop the chainstays down. Did you ask your Moulton rep? I think the problem with the spokes on my friend's bike was that the hub had very large diameter flanges, and it was a straight spoke lacing. As a result there was a lot of lateral stress placed on the spokes which they couldn't cope with. Perhaps I'm one of the "quite slow riders" to whom David Hembrow refers, but I absolutely love the TSR-2. I ride mine all over Chicago and find the gearing ideal for both city streets and the lakefront bike path. 1) Delta offers a number of combinations of front and rear cog and belt length for the C-Drive, making it possible to alter the gearing on the bike. Glad to see a review by someone who clearly "gets" the TSR-2. Hi nice to see a positive well written review. I guess I must be another slow rider. I have had a black TSR2 since October last year and have started to use it to commute across Cambridge. Even though Cambridge is flat I rarely get up to much more than 16-17mph before I have to stop for a pedestrian, lights or a crossing. There are some other mods shown there too, including adding a Klickfix mount to the front for luggage. You don't think it is a tad over priced for a bike with one v brake and a frame that doesn't fold? 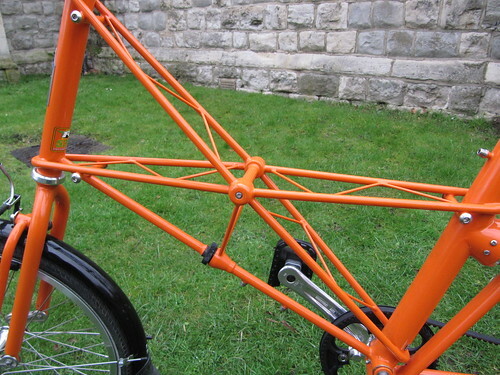 I owned Moulton Mks 1, 2 & 3 inthe '70'2 & '80's and they were alright but not wonderful. All that seems to have happened is that the designs have got more eccentric and the marketing hype has moved up several notches. What exactly does it do that a Brompton doesn't, or even a much cheaper Dahon? Ooo! Envious. Would make a fine stablemate for my brompton m3e. British small-wheeled bikes SO rule!! (Posted by Pip).
" Larger wheels not only go over rough surfaces better but always offer lower rolling resistance than smaller wheels. Diameter is a part of the basic formula for rolling resistance. Your legs have to put in 50% more effort to overcome rolling resistance of ETRTO 406 wheels vs. 622 wheels, if both are fitted with similar tyres." There's more to it than that. Using the first formula in the Wikipedia article that you linked (a more widely-accepted formula than the one you used) gives a 24% difference in energy loss between those wheel sizes. But that's not the whole story either. We're comparing a small-wheel bike with suspension and a large wheeler without. The suspension actually reduces energy loss because the rider's body is shaken up more on the unsuspended bike and that actually consumes energy too. "Dr Moulton's theory that a bike with small wheels and suspension could perform as well or better than a large wheeled bike was proven by racing versions of the machine taking some records." Nice review :-) I have one, in electric orange... have to put you right re luggage capacity, though. The TSR2 frame, like all the other TSR frames is ready to accept any of the purpose=built racks, made by Pashley for the range. I have tried the pannier rack, and the compact day rack and its matching bag, from Carradice, and can confirm that the bike's luggage carrying potential is first class - all part of Dr. Moulton's original idea. Just to add to the comments regarding the rolling resistance of smaller wheels, my experience as an owner of a Moulton (New Series, and in the past an AM5) as well as 700c bikes is that there is no noticeable difference. Granted, highly unscientific - but if the difference was as much as 50%, as suggested, it would surely be immediately obvious. The suspension also reduces total rolling resistance, since on unsuspended bikes the entire weight of the rider and bike (60Kg+) has to be lifted over any bumps or surface irregularities in the road. With any realistic road surface, the cumulative drag this adds must be significant. The gearing ratios are indeed quite low, but they seem well chosen for city riding - one easy gear for starting off from traffic lights, and one for city cruising speeds. Ccertainly in London, I can only rarely travel faster than 20mph due to traffic etc. Look, Moultons are lovely bikes. I've always said so. However, that doesn't change anything about small wheels simply not rolling so fast as larger ones. This is not merely theoretical. Measurements of rolling resistance consistently show the theory to be correct. And yes, it is indeed "immediately obvious" when it is actually tested properly. For example, a 28-559 Durano at 10 bar rolls 42% further than the 28-406 version of the same tyre. The difference in diameter is around 37%, so this is incredibly close to the theory (results from here). Suspension helps a lot with ride quality of smaller wheels, but it does little about the rolling resistance per-se. Why make an assumption that a larger wheel bike will not have suspension ? If you're going to use this argument, compare like with like. Many bikes with 26" and 28" wheels have suspension. While wheel size is always an issue, it isn't the only important factor. Good quality, high pressure, slick small tyres with skin-walls will roll better than low pressure, low quality larger tyres with thick side-walls. 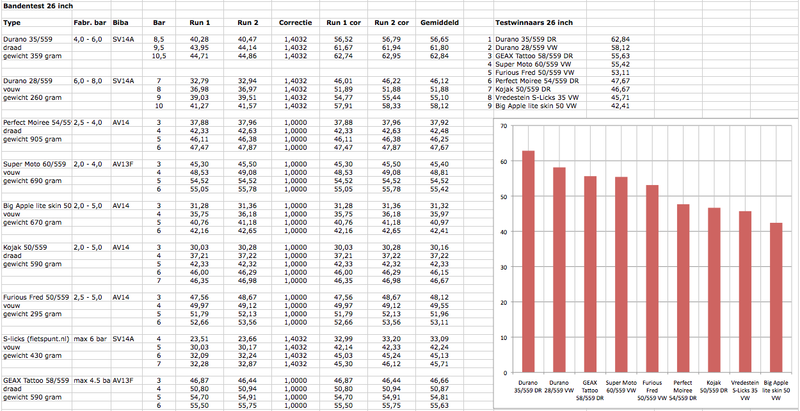 What's more, above 18 mph or so, aerodynamics are much more important than rolling resistance. Therefore, for faster riders the difference due to wheel size becomes smaller. 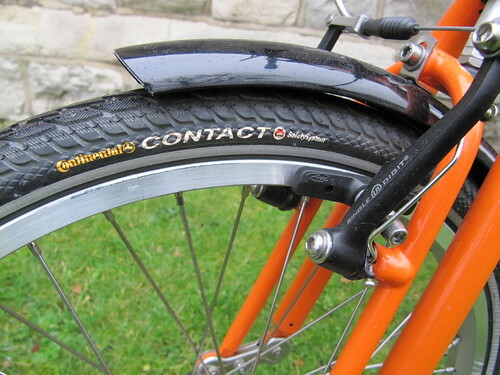 In the 1960s, Dr Moulton took care to have specially made extra light rolling tyres made for competition using his bikes. These helped the bikes to take some records. There were also records set using aerodynamic assistance, and indeed some people still try this. It will give an advantage over a normal bike because it counters what is a more significant problem than rolling resistance once you gain speed. However, the fact remains that slower riders exert comparatively more of their effort against rolling resistance, which increases linearly with speed, than they do against aerodynamic resistance, which increases with a log law. As such, a slower rider benefits to a greater degree from larger wheels. I'm not against small wheels, I'm just against nonsense being disguised as fact. My fastest bike has the same wheel size as the Moulton under discussion. As they, and their suspensions struts, fit inside the aerodynamic shell, the combination allows me to ride faster than I ever have before. Indeed, last year I averaged not much under 25 mph for the duration of a six hour long race. The small wheels don't help with this. My bike goes fast despite their higher rolling resistance. It is possible because in this case other factors more than compensate for it. However, those factors don't apply to the Moulton above. To do anything like that speed for that duration with that bike would require someone with superhuman strength who could also keep up an impossible cadence. I know I'd do better on my normal Dutch town bike, or indeed on my old English roadster, than on this particular Moulton with high rolling resistance and what for me would indeed be rather too low gearing. You simply can't disregard physics. I don't 'need' another bike but am tempted to use cyclescheme to get one of these 'town Moultons'. I think was cycle active that were equally enthusiastic a few month ago. How long does it take to separate? And David wouldn't it be great to see a Moulton recumbent offered for open road use. Suspension, low air resistance from the tyres.... Funnily enough 700 wheeels are all the rage with high racers. While I do not own a TSR2, I own and have been riding a TSR27 for three years now, and in that time I have covered some 21,000 miles on it. The Moulton is the quickest, most comfortable cycle I have had in more than forty years of cycling. Wading in to the rolling resistance debate, I think that while David is undoubtedly correct that small wheels do not roll as well bigger ones, he is vastly overestimating the amount of drag that any kind of wheels generate. Think about how far a road bike will freewheel on a flat surface without losing significant speed, and that's with wind resistance and the friction of the hub etc slowing it down as well. A 50% increase on a very tiny number is still a tiny number. I'm 52 and ride an old APB fitted with an 8sp Shimano internal hub and cheap BMX road tyres. Not the lightest or most efficient bike I'm sure. However, the only cyclists that routinely leave me behind are "club riders" on their racing bikes. No other riders on any other type of bike seem to be any quicker than me and I can't imagine anybody on a "Dutch Town Bike" giving me too many problems. Being car less, I have to use my bike for everything, including shopping, and have also toured France on it, carrying luggage and tent. I've been riding a belt-drive Spot Rocker SS for a year now (Spot Brand being the Golden, Colorado, USA company that worked with Gates on the original belt drive for bicycles). Though it does have some downside, I am generally very impressed. The good: Never needs oiling, so it's super-low maintenance and it won't leave lube on your trousers. It is incredibly silent. I find myself accidentally frightening pedestrians as I approach from behind. The belt is said to last 5-10 times longer than a standard chain. I don't know yet, but after a year I still cannot detect wear to the belt or pulleys. The less-good: The biggest issue is that changing the gear ratio is more complex than usual. You can't take a "link" out of the belt, so pulleys and belt must be ordered as a unit after precise calculation. The pulleys and belt are expensive, maybe 2-3 times the cost of standard cogs and chain (though with their longer wear it could be argued that they're a bargain anyway). The belt can, at times, slip off. Thus, the new design with a center channel on the belt matching a groove of the pulleys to prevent this. The belt requires pretty high tension that may be difficult to get just right. With the help of my local bike shop I'm now up to speed on the tricks of belt drives and am completely sold. All my single speeds have belts and I doubt I'll ever go back to chain drive. Although Dr Moulton is undoubtedly a pioneer in bicycle design, I feel he missed an opportunity in failing to develop a Moulton recumbent. Apparently he doesn't like the recumbent position. Certainly for town riding the recumbent isn't ideal. I have converted a series one Moulton into a recumbent and can only say it is a vast improvemnet over the original in terms of speed and comfort especially for touring. The biggest drawback with this bike, apart from town riding, is the weight; despite this I travel significantly faster than on an upright. I can only imagine what the latest Moulton would be like as a recumbent (cycling Heaven)! 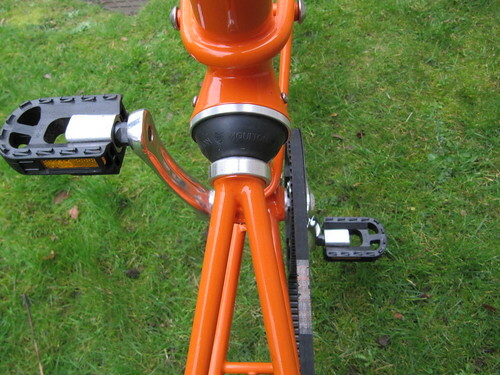 Just came across this review; I haven't had the pleasure of trying out a "belted" Moulton, but I don't see there being any major issues with this drivetrain, especially given the bike's target audience. As far as wheel size and performance goes, I can only give anecdotal evidence. I purchased my AM14S ("Sport" specification with drop bars, 9-28 rear seven-speed cogs and 52/62 chainrings) 26 years ago - almost to the month. On club rides I would regularly be queried as to whether it was a good idea to try and hang with the pack on the thing; Before long, the other riders would line up to take turns tolling around parking lots during rest stops, pretty much shocked at the comparatively silky ride and nimble handling and acceleration. (Suspension was at most a MTB novelty at the time, if that, and a totally alien concept for roadies.) This was, however, before the delivery of my AM/Zzipper fairing; the thing was suddenly so fast that I was frequently goaded into taking paceline pulls. I'd be lying if I said I didn't like all the attention. And, all these years later, it's my favorite of my three current bikes. Expensive? Yep. (If I had it to do over again, I couldn't sadly.) But when you still love a bike like this after a quarter of a century, is initial cost, assuming you can somehow swing it (and thinking about what people pay for cars that won't last nearly as long), that big a deal? Regarding the interesting tyre roll-down test, I haven't read all the material but did they consider weight? The bigger wheels are obviously heavier, meaning more momentum to keep the vehicle going after rolling down the ramp (see pictures). If you look at the tables David links to, you can see that among the four models of Durano tyres, the heavier ones rolled further than the lighter ones. Ditto for Kojaks, the heavier Kojaks rolled further. I'm biased as a happy Brompton owner. I don't feel wheel size makes a practical difference. In a test in Bicycle Quarterly Summer 2011, they couldn't detect a difference between three sizes of Schwalbe Marathon, 622mm, 584mm and 559mm. I agree with a lot of what you're saying here but it could do with more detail. They stayed away in droves. Reading this post reminds me of my old room mate! He always kept talking about this. I will forward this article to him. Fairly certain he will have a good read. Many thanks for sharing! You claim "The V-brake will let it down a little so far as reliability is concerned"
How can you possibly make such a claim? I've put in over 150,000 km with V brakes and never had a problem. Millions use V brakes , and they are renowned for reliable, problem free stopping. You also say: "Your legs have to put in 50% more effort to overcome rolling resistance of ETRTO 406 wheels vs. 622 wheels, if both are fitted with similar tyres." 50% !!! Do you even realise what you are saying? So how is it that a 17" wheeled bike - a Moulton - holds the world speed record for an upright bicycle? Did they find someone with 50% more leg strength? Your comments are just utter nonsense. Hi, I just found your review of the Moulton. 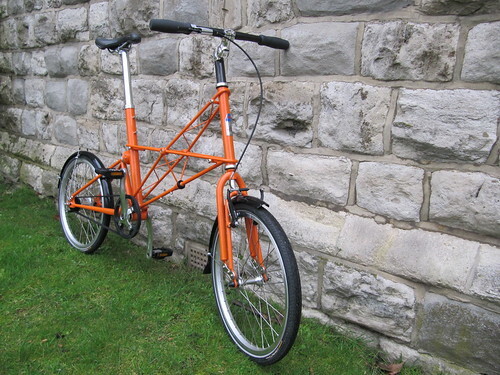 I have one of these (TSR 9) as well as a very low price Dahon Vitesse folder, and a road bike. 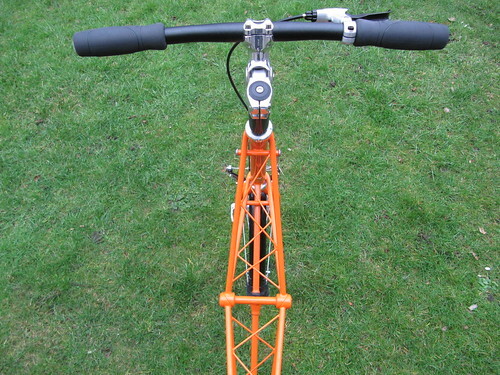 The UK price of the Moulton TSR9 is currently between £1200 and £1350 depending on the paint. It’s a bike with front and rear suspension, a nine speed drive, V-Brakes, and flat handlebars. The suspension damping can be adjusted, it can be locked solid (with a spanner) or the preload can be adjusted for the riders weight. The frame is nicely finished, but Moulton, even at this price range fit the bike with low price components – the derailleur is an SRAM long cage – a short cage would fit, but maybe Moulton believe riders may want to upgrade to a triple crank. V-Brake levers are low-price Avids. There’s no side-stand, and it’s hard to fit one. There’s no luggage rack and Moulton ones are pricey. There is an adjustable stem for a small range of height adjustment, but the bike will not suit the petite. Cost cutting is evident all over the bike. The serial number is not stamped into the frame (that I could find) but is a sticker. Wheels and hubs are low price Quando cup and cone wheels, as on the Dahon. 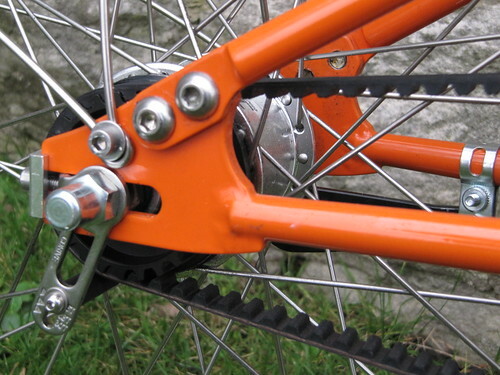 Chainset is a low-price Sturmey Archer. There’s no replaceable derailleur hanger – the frame needs a repair if you snap off the derailleur – unthinkable on a 21st century bike. The frame doesn’t fold, but can be separated into two pieces. The star-nut cover on the fork tube is cheap plastic. In comparison, the Dahon Vitesse has seven gears, folds easily, has very similar components, is lighter than the Moulton, won’t rust, and the derailleur hides under the chainstays. It’s an altogether more complete design, rather than a series of compromises bolted to an expensive frame. It cost £350 new. What the Moulton is then, is a hand-made anachronistic expensive Brit throw-back suspension frame, with low-priced components. It rides pleasantly, but so does the Dahon. Even at £1200 the Moulton needs a short cage derailleur to tidy up the rear wheel and prevent frame breakages, at least. The problem is that the Moulton sells on its heritage. But 21st century bikes like the Dahon are similar equipped and more versatile. But, the Moulton has suspension. So, that’s kind of where I’m at; a Moulton owner, but not an impressed one. I have a bike like that and when I am using it, I feel so comfortable and it's easy to control. The chair is just ok and smooth. Does there any fairing have some parts of it? The best site layouts are very pleasing on the eyes, are easy to navigate and provide readers with all of the information that they need to know quickly and simply. really good bikes, thanks for sharing this.